Here is my DT card at One Stitch At A Time challenge blog. We like to see "White" projects. It is so cold and snowy, here in Canada, so my card totally goes well with the challenge. 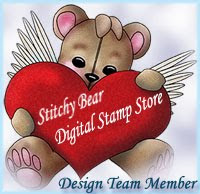 This gorgeous breathtaking image by Teri at Delicious Doodles in the Stitchy Bear Shop. As you see i decoupage image, by printing 3 times and cut on pieces. I colored image with very light shade of Peacock Feathers distress ink, and added diamond Dust everywhere. I love how it's sparkles. Here is some picks on 3D's look. Oh my this card took my breath away...and you mentioned in your post about the image being breath-taking!! I love the soft subtle colour of it. And all the glitter...oh my...quite stunning. WOW ! Simply love job on your card. The decoupage is great and I adore all the glitter. Sorry I have not commented on your blog lately, been out of my mind busy. Have a great day!! Oh Nataliya, even when you are challenged to limit your colours you still created a card of such beauty that I do feel overwhelmed. You have chosen to use a very beautiful image and decoupaging it has given such depth beauty, the privileged union between man and beast is highlighted by the beautful and sensitive colour you chose. I love the sparkling winter wonderland ....I almost feel that I'm with you in Canada, out in the magic of the pure crisp snow that you are experiencing this winter. Thank you for this magical card dear friend ....I'm very moved by it. Hello Miss Nataliya, BREATHTAKING... All those gorgeous layers, your fussy cutting is fantastic, gorgeous image, all that shine and sparkles makes my Magpie eyes glitter, it's an enchanting creation, thanks for sharing, have a wonderful week..
What beautiful card, just took my breath away. Love all the sparkle and shine, totally looks like snow when the light hits it just right. I grew up in Colorado so this card reminds me of the beautiful snow that would shimmer during cold winter nights. I'm Back to my Whoopsi Daisy Team!!! DT Inspiration With Sweet Pea Stamps.